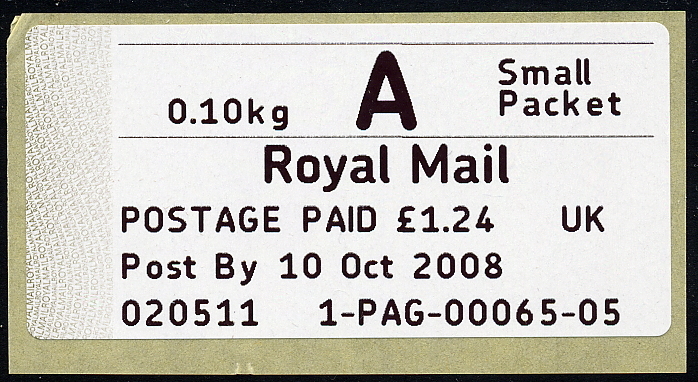 In a further quest towards a unified set of labels and to aid operational processing, Post and Go kiosks yesterday(30th June 2009) started to be upgraded to print labels that conform to the existing ‘smartstamp’ format. the Epson inkjet counter printer for the ‘SD’ Overprint at the pointof posting. Five Stamps and Eight Labels-A set of Thirteen.. I have now updated the pages showing the full set of labels and fast stamps produced by UK Wincor-Nixdorf Machines. 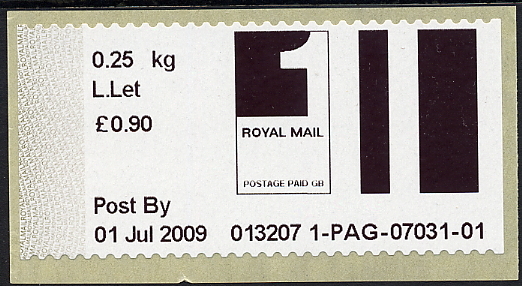 There are Eight Different Labels and Five Fast Stamps issued by Wincor-Nixdorf Machines in the UK.